The 70′ sailboat RAGE holds the record for the fastest elapsed time for a monohull from the west coast to Hawaii. In 1994, she set the record of eight days, seven hours and thirteen minutes in the West Marine Pacific Cup from San Francisco to Kanoehe, Hawaii. RAGE took another seven hours off that record this past year. Since RAGE’s launching in April 1993, she has set several new records. 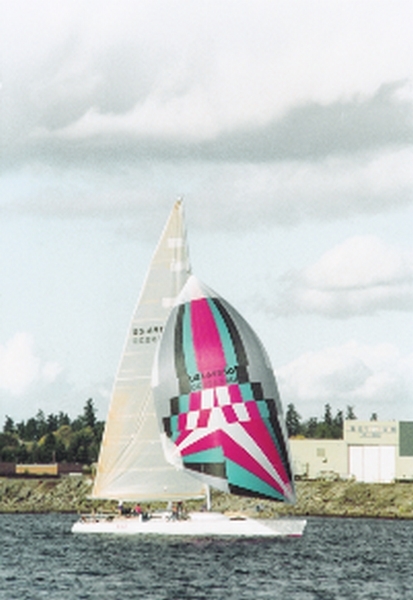 In the 1993 200-mile Oregon International Offshore, she was the first to finish, setting a new course record. She finished first again in that race in 1994, correcting to first overall. 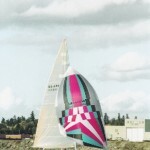 RAGE was first to finish in the Swiftsure Classic in 1993 and again in 1994, correcting to first overall. She was the first PHRF boat to finish the 1993 Transpac, correcting to first in class. RAGE also took three hours off of SAYANARA’s record in the 1996 Oakland to Catalina race. The Tom Wylie-designed RAGE is built primarily of wood and WEST SYSTEM® Epoxy. She has a Klegecell™ foam core sandwiched between layers of spruce and cedar veneer. Builder and owner Steve Rander of Schooner Creek Boatworks in Portland, Oregon, said RAGE is the stiffest, strongest boat he has ever sailed. This strength contributed to her record setting performances. At 21,000 lb. displacement, she is one of the lightest west coast “sleds” and should be one of the longest lasting. Steve now wants to build an even bigger and lighter sailboat using the same construction methods, but wanted to look at a different laminate for the new boat. 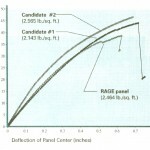 Steve made up three test panels, one identical to that used on RAGE, and two new candidates. Bill Bertelsen, our chief test engineer (now retired), sized the panels to fit in our Hydromat test machine and performed stiffness and strength tests that are plotted in the chart together with the weights of each panel. Steve now has comparable data that he can use to make a more scientific decision on the panel scantlings that he will use for his next boat. It will be six feet longer than RAGE with more righting moment. The new boat will also be a Tom Wylie design. It should be the main candidate on the west coast to finally beat RAGE’s unbelievable San Francisco to Hawaii record. RAGE specs are 70’ LOA, 65’ LWL, 13.5′ Beam, 10’ Draft, 21,000 lb. displacement in racing trim with 10,000 of it in ballast, sail area upwind at 2,150 sq. ft. and downwind 3,090 sq. ft.
For more information on RAGE or other performance cruisers, visit Schooner Creek Boat Works. Schooner Creek hull test panels, ramp-to-failure tests. This entry was posted in Boat Construction, Yacht & Large Vessel Construction and tagged #9, Epoxyworks #9, Meade Gougeon, RAGE, Schooner Creek Boat Works, Spring 1997, Tom Wylie on June 29, 2014 by ewadmin.